With the negotiations between the European Union (EU) and the United States on a transatlantic trade agreement (TTIP), so-called ‘deep and comprehensive’ trade agreements have become the object of controversial public debate in recent years. However, TTIP is just one element in the broader EU trade regime established over the last decade. 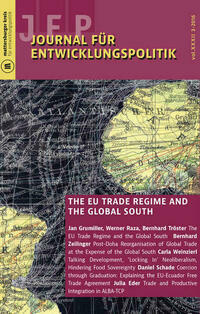 This issue focuses on the trade relations between the EU and countries in the Global South. The articles highlight specific aspects of the EU trade regime, ranging from its underlying strategy to the effects on food security in Sub-Saharan African countries, as well as alternative approaches to trade policy.